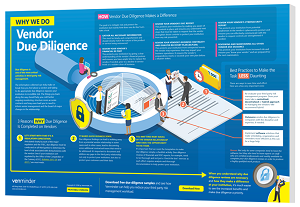 Vendor due diligence is one of the most critical activities in vendor risk management. The things you learn along the way should affect what you do throughout the relationship. When you understand why vendor due diligence reviews are necessary, it’s easier to see the increased benefits and make due diligence a priority. Download this infographic where we'll further explain how they help.